Explorers! Welcome to our Epic Strike Event Guide for today’s Strike Event! This one features three very powerful uniques: Level 30 Diloracheirus, Trykosaurus and Indoraptor! Disclaimer: This is most likely the hardest Strike Event we’ve ever had and will get. 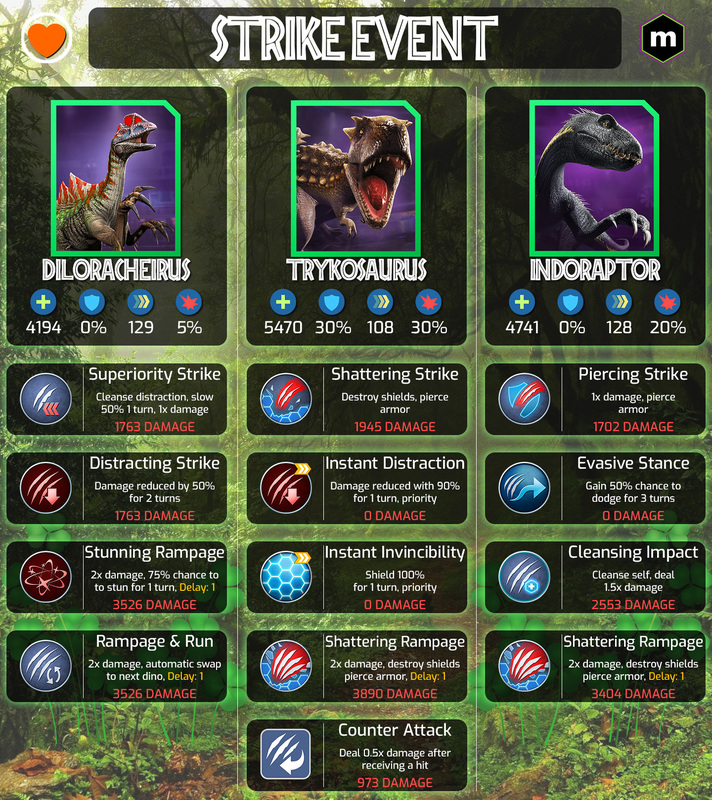 This Strike Event is most likely impossible unless you’ve got some very powerful dinosaurs, as these dinosaurs are high in our Tier List for a reason. These dinosaurs pack a real punch. I’d advise to not waste your hard cash on a retry unless you are certain you can beat it in your second try. With the disclaimer out of the way, let’s see if we can beat this Strike Event! We’ve got another amazing infographic thanks to our amazing artist Orange Heart! This Epic Strike may seem impossible, as these three dinosaurs are extremely powerful, even when faced alone. We cannot think of a decent strategy to beat these three dinosaurs. Therefore, I’m going to do this a bit differently and I’m going to list some counters to each individual dinosaur, to give you an idea of which dinosaurs you should use. Disclaimer #2: I will be listing Unique dinosaurs in this list, as some are just mandatory to beat these dinosaurs. It’s going to be very likely that your Common, Rare and even Epic dinosaurs aren’t going to make it, due to the sheer difficulty of this strike. This one is one we can actually guide you to beat. If this one’s coming out, use a Lethal Wound user to bleed it, and then swap into either Dracoceratops or Dracorex GEN2. The last thing you want is this thing running into another dinosaur, so prevent that at all costs! The combination of Lethal Wound + Swap In Shattering Rampage will be enough to kill this Green Chicken if your Dracorex/Dracoceratops is at level 16. Your Dracoceratops/Dracorex GEN2 will die though, keep that in mind. Other counters/checks would be Stegoceratops/Monostegotops. These dinosaurs can slow and stun Diloracheirus to stop it from attacking. I cannot stress enough that you should dispatch of this dinosaur before it can run away! It’ll give you a big problem later if you let it get away. Trykosaurus is the tank in this strike. And how do you deal with tanks: Bleed. Bring something that can bleed it out, like Suchotator or Spinotasuchus. But remember that Trykosaurus has massive attack combined with a counter that will quickly put it’s damage output at around 2900 on TURN 1! DO NOT UNDERESTIMATE that 0.5 counter attack! It’ll catch you by surprise at how much damage it’s going to do. Other counters to Trykosaurus are to distract it with dinosaurs like Diloracheirus, Diloranosaurus and Magnapyritor, or to stun it. Utasinoraptor and Utarinex are also good options, but they rely on getting that stun and need to be at a high level to deal with Trykosaurus. Or else high damage chompers like Tenontorex and Thoradolosaur are good counters to this thing. We go into greater depth on how to beat Trykosaurus in our Trykosaurus Counter Guide, link is right here. This is most likely going to be the easiest one, as it has been featured in a lot of Epic Boss Strikes already. You can 1v1 this Apex tier dinosaur with a level 17 Suchotator, following this order: T1 Indo uses Cleansing Impact, Sucho Lethal Wounds. T2: Instant distract the incoming DSR. T3: both Indo and Sucho drop. Other counters to Indoraptor are fast dinosaurs like Velociraptor, Diloracheirus, Erlidominus, Procerathomimus, etc. Monostegotops and Stegoceratops can also prove useful with the slowing, stunning and, with the former, nullifying. We also have a Counter Guide for Indoraptor where we go into greater depth. The link is right here. And if all else goes wrong, test your luck by bringing Evasive dinosaurs like Indoraptor, Procerathomimus, Monomimus, Ornithomimus and Gallimimus for a Hail Mary tactic. If you were succesful, this Strike Event awards an Epic Incubator, with coins and DNA rewards varying depending on your level! The DNA can be from every dinosaur except Arena Exclusives! This Strike Event is the hardest one I’ve ever seen. Don’t feel ashamed if you couldn’t do it, as most people will most likely fail. I once again want to recommend to not waste your hard-earned cash on a retry, unless you’re certain you can defeat it the second time. If you were succesful, let us know how you did it in the comments or join MetaHub’s Discord server and share your experiences! Happy hunting everyone!